The first hints of spring inspire many gardeners to consider planting roses. While many perennials and shrubs are planted in the fall, the best time to plant roses is early spring. You can plant either bare root roses or container grown rose plants in the spring and be enjoying blooms by summer. Before setting out rose plants or bare roots, you want to check your gardening Hardiness Zone to find the date for the last frost. You will then plant your rose plants/bare roots following the zone guideline. In most hardiness zones, the best time to plant roses is early spring. This is sometime between late February and early April. Find your gardening zone with the online USDA hardiness zone finder. Simply enter your zip code and follow the first and last frost dates given. The first frost date for the year comes in the fall. The last frost date for the year is in the spring. You can use the USDA Hardiness Zone map to ensure you're using the right zone information. The zones are listed 1 through 13. According to Rogue Valley Roses, Zone 3 is the coldest zone possible to grow roses. Zones 10 to 13 might not have enough winter cold for Alba and Gallica rose classes to flower, so check with your local nursery before buying. Zone 3: The last frost date is May 15. The first frost date is September 15. Zone 4: The last frost dates is May 15 to June 1. The first frost date is September 15 to October 1. Zone 5: The last frost date is May 15. The first frost date is October 15. Zone 6: The last frost date is April 1 to April 15. The first frost date is October 15 to 30. Zone 7: The last frost date is mid-April. The first frost date is mid-October. Zone 8: The first frost date is October 11 to October 20. The last frost date is March 21 to March 31. Zone 9: The timeframe between the first and last frosts is often one to two weeks in January. Roses should be planted after all danger of frost has passed. The soil should be warmed up and easy to work after that date. Soil that's too frozen or sopping wet and muddy from spring rains shouldn't be worked. If the soil is muddy, wait until the soil has dried enough to allow proper planting. Full sun: Defined as six or more hours per day of direct sunshine, full sun means your roses should receive morning light. An eastern, southeastern or southern exposure is ideal. Air circulation: Roses need good air circulation, so be sure that you don't plant them in a closed in or a boxed-in area that doesn't receive fresh free flowing air. Place to avoid planting: You don't want to plant roses too close to buildings or near large trees. Both locations can set-up conditions for the growth of molds, mildews and other microbes that cause black spot, a disease that can weaken or kill the plant. Soil type: Roses like rich soil and love compost, especially composted horse or cow manure. Add as much compost as you can to the soil prior to planting. Compost: As with all composts, be sure that any compost added to the soil has a chance to break down before planting. Manure: Never add fresh manure directly to the soil or near plants as it can burn tender roots. 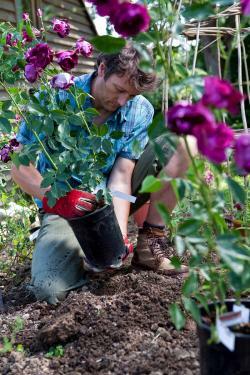 Keep in mind that bare root roses should be planted as early in the season as possible. Bare root roses are the kind you see in boxes and are usually the types shipped via mail order. You should plant while still dormant, or before shoots begin to grow off of the main branch. You can and should plant a bare root rose that's already begun to sprout, it's better for the plant if it's in the ground before it begins to put the energy into growing new leaves and stems. There are special instructions for planting bare root roses since they're planted a little differently than potted or container grown roses. 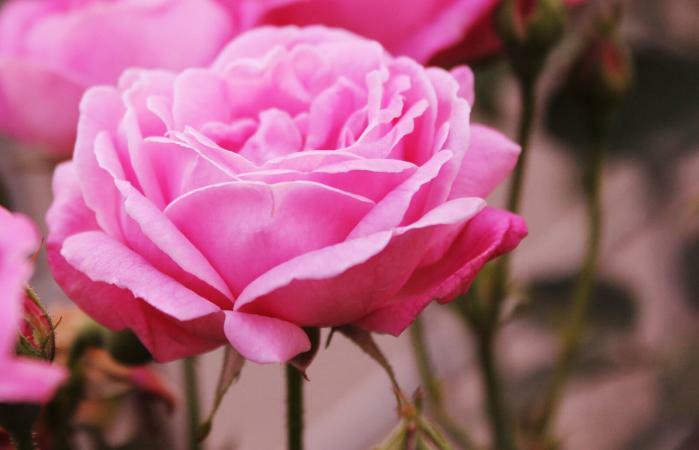 Be sure to review the guidelines for rose planting from Ohio State University. Bare root roses have a lower survival rate than potted rose plants. It's all about timing when it comes to planting roses. Make sure the danger of frost has passed before setting out plant or bare root roses and you'll have lots of blooms all summer.